At the forum of the site allaboutjazz.com, a user asked for inputs on the tune “Stitched up”, which Hancock released on his album “Possibilities” in 2005. I explored the tune using Wavelab and could give some feedback. The user asked spesifically for the chord in the break after the opening, which is a G13 sus. 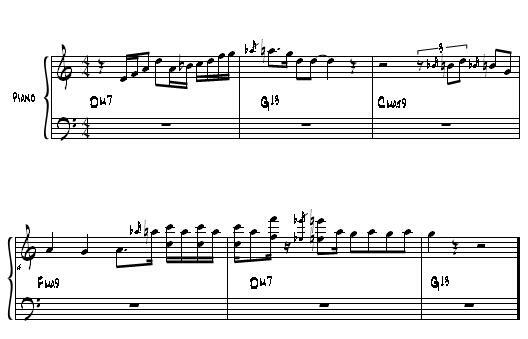 I also transcribed Hancock’s solo on the bridge section, which I typed into Finale 2010 and further exported to JPG for insertion in the posts on the thread on the allaboutjazz.com page. I play hammond organ, and my band and me had the idea of playing this song. So, hence my question to you: would you send me a pdf of the transcription you made? That would be soooo helpful…! All the best anyways !